Hiscox - Deluxe cello case Using the same world beating 'Liteflite' double moulded construction, the deluxe cello case has 148 sq ins of firmer cushion padding to give even greater shock absorption than our standard cello case. Upholstered in a luxury quality velour, the cello case is finished with 2 hand stitched leather shoulder handles. As with the standard cello case, the Ivory shells are a higher specification than the Black, giving even greater impact resistance and thermal insulation. 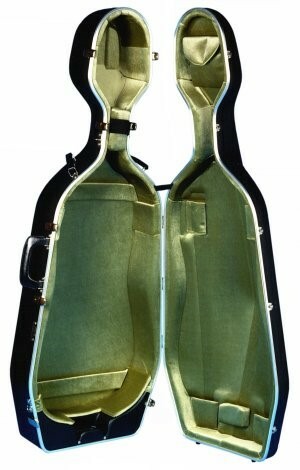 The case includes 2 cello bow holders in the lid and 2 heavy duty carrying straps. Internal Dimensions Body Length: 787mm Spike Length: 80mm To order only usually 2-3 days.